Last year it was the new high rise sales that crashed. Now it's the low rise sector that is in free fall. But first, let's take a look at condo sales. New condo sales in the city of Toronto are down 7.8% in January from a year earlier according to Building Industry and Land Development Association. 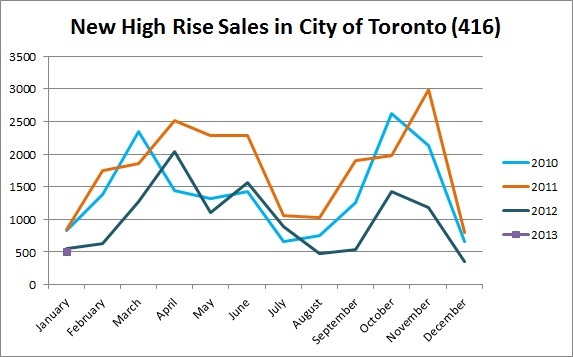 While this number may seem small, please keep in mind that in 2012 new condo sales went down by over 40%. 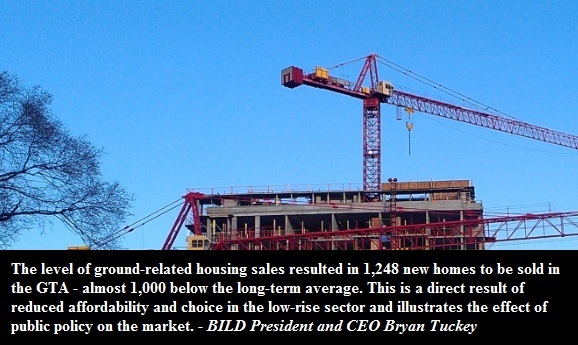 Compared to the sales peak achieved in 2011, new condo sales are down by 39%. 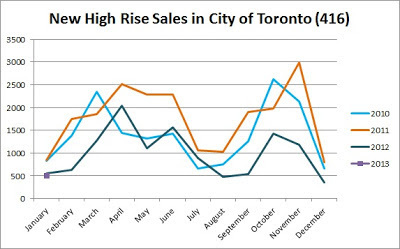 If we look how sales compare to a long term trend, new condo sales in the city are 11% below the nine year average. The purple square represents January, 2013. New low rise sales in the city of Toronto were down 66%. But before you run to call your real estate agent to list your investment property, note that there were 20 less new low rise sales in January 2013 than the 30 sales that took place in January 2012. Though, if I were you, I would still list it asap. Throughout the GTA, new low rise sales went down by 52%. There were only 562 sales past January compared to 1174 that were sold in January 2012. Overall, new home sales (both condos and low rises) were down by 35% on a year to year basis and down by 44% from two years ago.